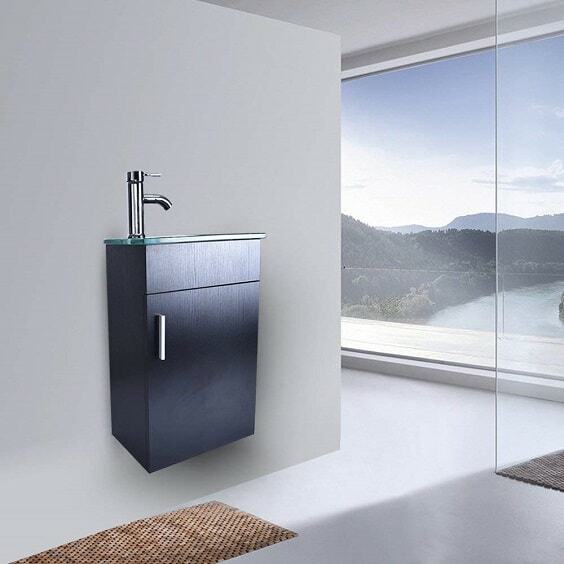 The bathroom accessories don’t only provide the convenient function to use your bathroom stuff conveniently, but it also influences the look of the room. Yeap, the bath set also has such an important role to decorate your bathroom layout. 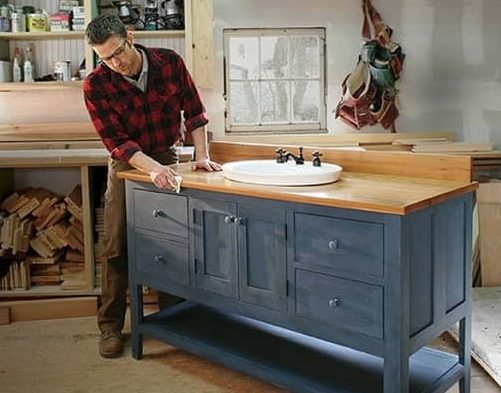 Therefore, choosing the one which looks beautiful is such a must to create a good-looking bathroom. It will create such an inviting nuance that makes your bath time feels more exhilarating. With lots of bathroom set products available in the market, you can always choose the one that suits your needs and taste. They are available in various designs to enhance the beauty of your bathroom decor. The gold bathroom accessory may become one of the best choices when you want to style up your bathroom. It’s been long known that gold always gives such a gorgeous touch to a room’s overall look. Here, we have dozens of white and gold bathroom accessories which are available on Amazon. We have picked them based on their quality, beauty, and average customer reviews. The gorgeous white and gold bathroom accessories with the gold and transparent look that will dazzle up your bathroom decor. It’s designed in a geometric shape which makes fit the modern decor very well. The construction is made of high-quality resin which doesn’t feel cheap at all. It’s so sturdy which tells a lot about its durability. 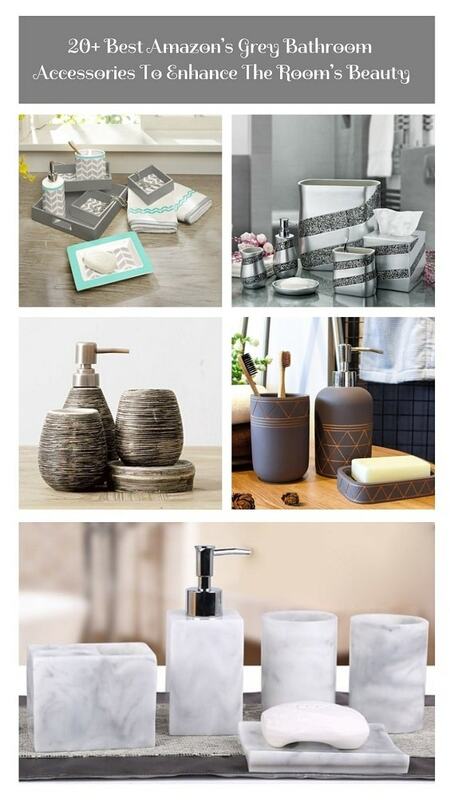 On Amazon, theA�Gold Bathroom Accessories by HotSan is offered at $34.99. The package includes 1 soap dish, 1 lotion dispenser, 1 toothbrush holder, and 2 tumblers. 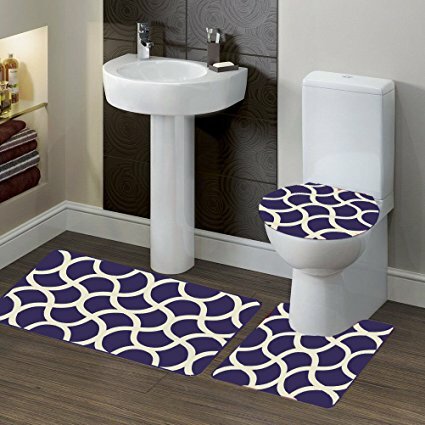 The decorative white and gold bathroom accessories which will make your bathroom look gorgeously festive. It comes with the diamond lattice detail in gold on the white background. The sets are all made of resin with the satisfying quality. You can feel the durability of the product at the first touch. You can purchase this Amazon’s Choice for Gold Bath Accessories by spending $39.99. It includes 1 soap dish, 1 lotion dispenser, 1 toothbrush holder, and 1 tumbler. If you are looking for a more colorful white and gold bathroom accessories, this product can be one of your best options to buy. It comes with the combination of gold, maroon and brown which looks so luxurious. 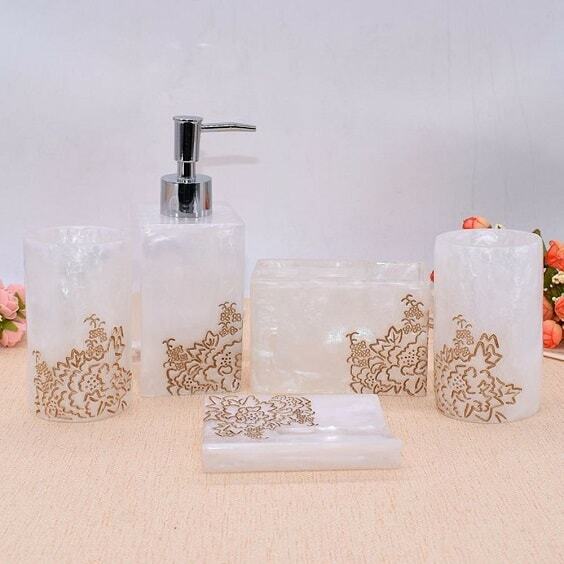 Each of the set is made of durable polyresin so it will stay beautiful for years in your bathroom decoration. It’s also easy to take care of with just a little bit wipe. TheA�5-Piece Bathroom Accessory Set by Sweet Home Collection is available on Amazon with $74.99 price tag. 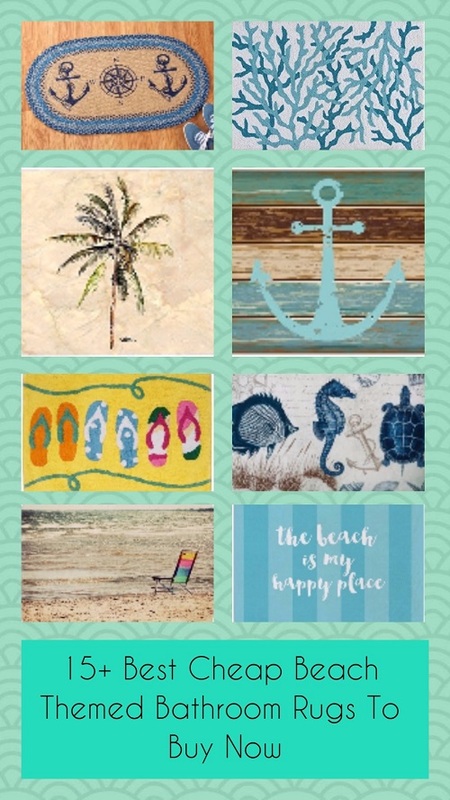 By that cost, you can get 1 soap dish, 1 lotion dispenser, 1 toothbrush holder, 1 tumbler, and 1 shower curtain all in matching colors. 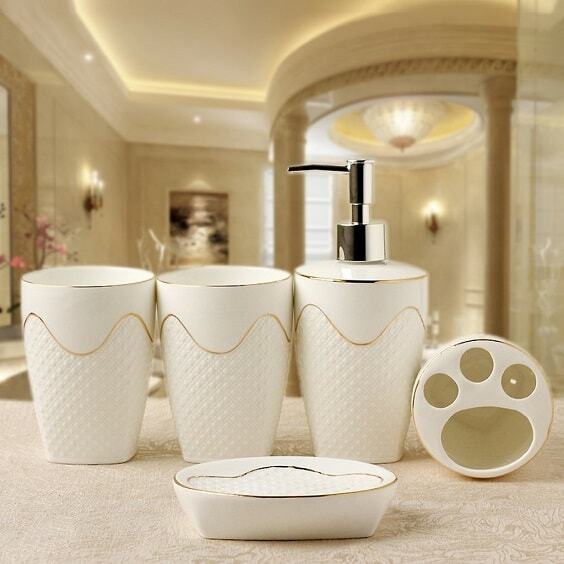 The dazzling white and gold bathroom accessories with marble finish which will beautify your bathroom decor. It has the gold trim on its bottom which glamorously adds color to its overall design. The material that builds up the construction is ceramic which is sturdy enough to be your long lasting bathroom accessories. 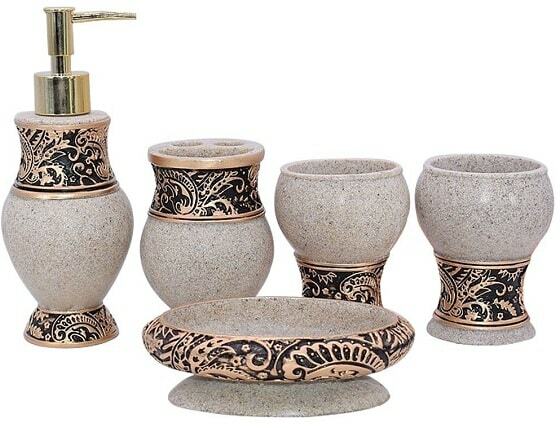 You will not be disappointed by the quality of this bathroom set. 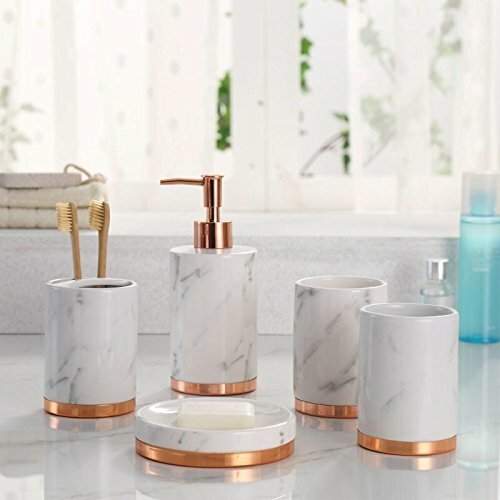 The price that you have to pay for theA�5-Piece Marble Look with Rose Gold Trim Bathroom Accessories by Robinson Carpenter Los Angeles is $49.98. 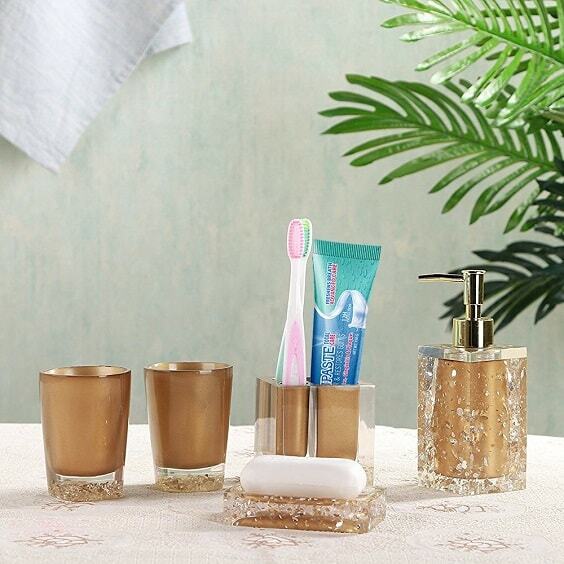 You will get 1 soap dish, 1 lotion dispenser, 1 toothbrush holder, and 2 tumblers all in the same elegant marble look. 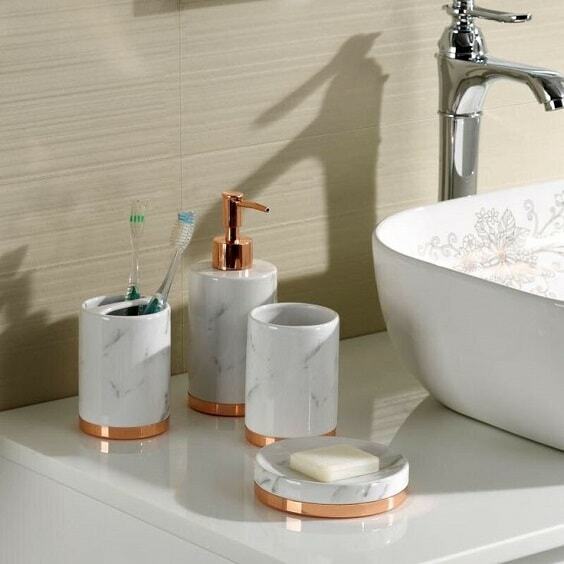 The combination of the clear transparent body with a rose gold accent of this bathroom accessories is so gorgeous. It’s designed in the clean-lines rectangular style which is perfect for a modern decor. Made of durable plastic, this product is quite reliable to use for years. The material’s quality is fairly good as long as you don’t wear it excessively. 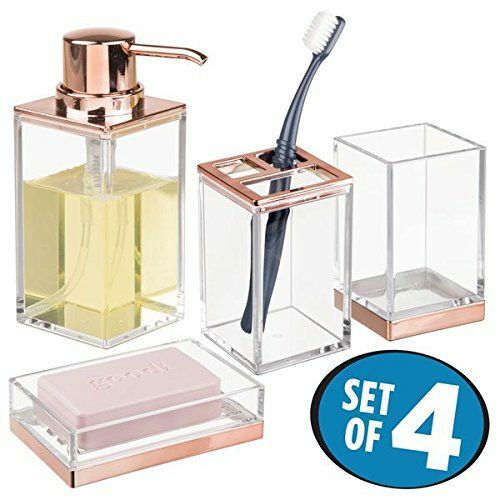 You can find theA�mDesign 4-Piece Rose Gold Bathroom Accessories by Metro Decor on Amazon with only $19.99 price tag. With such cheap price, you will get 1 soap dish, 1 lotion dispenser, 1 toothbrush holder, and 1 tumbler. 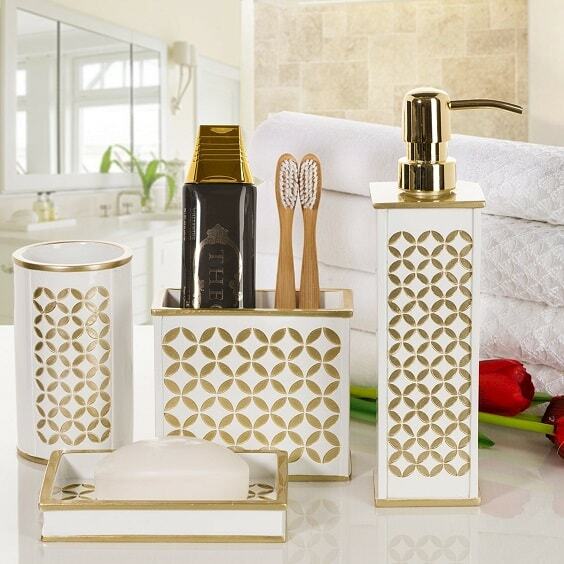 The beautiful white and gold bathroom accessories with the classic design that you can’t miss. You can see the flowers and leaves in the white and gold finish give such a gorgeous touch to its overall design. 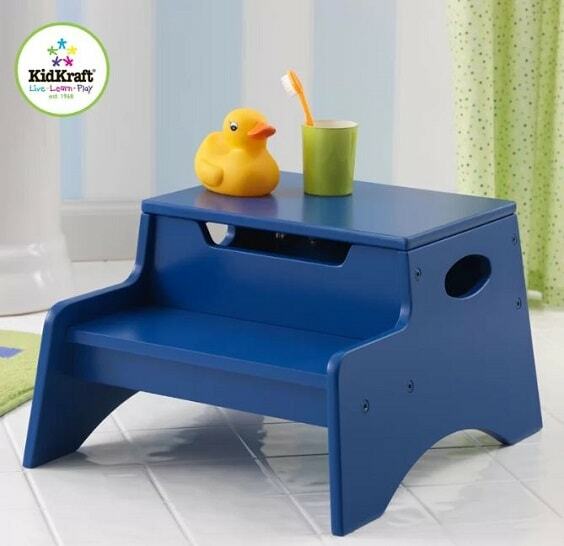 The product is made of high-quality resin which will not easily break due to its great durability. You can safely use this bathroom accessory for years. 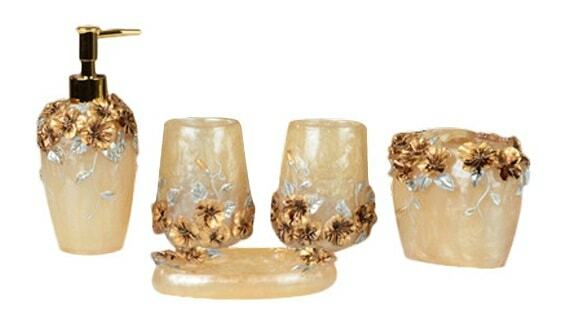 On Amazon, theA�Narwal Date 5-Piece Golden Bathroom Accessory Set by SenwishA�is offered at $38.50. The package includes 1 soap dish, 1 lotion dispenser, 1 toothbrush holder, and 2 tumblers. 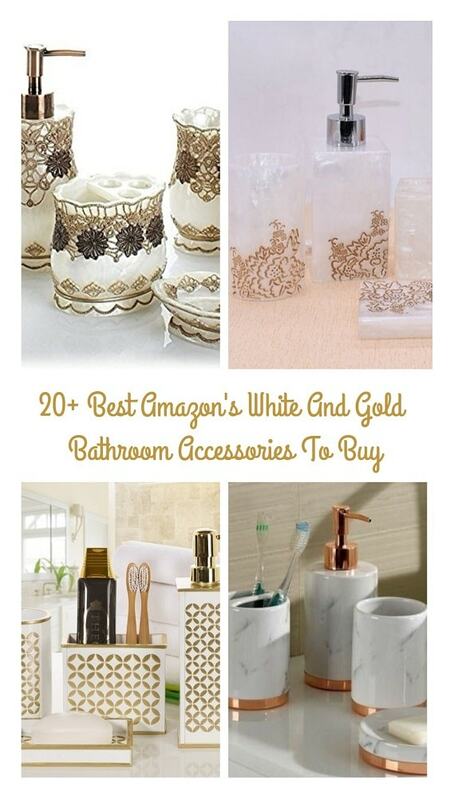 The complete white and gold bathroom accessories in gorgeous design for your ultimate decor. It’s dominated by the white finish with a catchy accent of rustic gold and rhinestone gems in each unit. The construction is made of reliable resin. Such material makes it withstand the bathroom condition for years. TheA�6-Piece Victoria Jewel Bath Accessory Set by Sherry Kline is sold at Amazon with $119.45 price tag. You will get 1 soap dish, 1 lotion dispenser, 1 toothbrush holder, 1 tumbler, 1 tissue cover, and 1 waste basket. 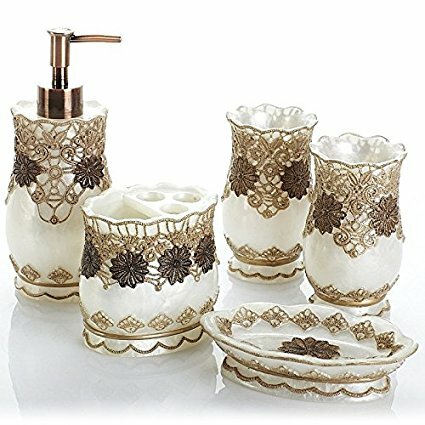 The stunning white and gold bathroom accessories which fit for you who need something classy in a vintage style. It’s finished in off-white with ceramic-look and floral bronze accent. Though it looks like a ceramic bathroom stuff, this product is actually made of resin. Therefore, it’s more practical for you to use daily. Looking for the white and gold bathroom accessories in minimalist look? This product is the one that you can’t miss with its dazzling white body and shining gold line design. The material that builds up the product is plastic which is fairly good. Its quality is not disappointing for the price. As a luxurious white and gold bathroom accessories, this product will never fail to bring the style of your decor to a whole new level. The golden finish with the crystal-like accent in a quatrefoil pattern of this set is surely beautiful. The high-quality polyresin is the material of the set makes it so durable. It won’t easily break and reliable enough for everyday use. 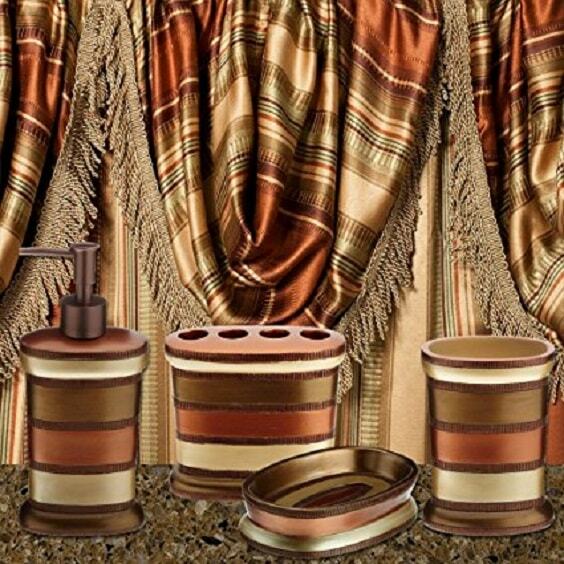 By spending $54.99, you can purchase theA�6-Piece Bathroom Accessory Set by BH Home & Linen on Amazon. The package includes 1 soap dish, 1 lotion dispenser, 1 toothbrush holder, 1 tumbler, 1 wastebasket, and 1 toilet brush. Another simple choice of white and gold bathroom accessories that you can include in your shopping list. It comes with gorgeous design in white overall look and thin gold line which looks simply gorgeous. 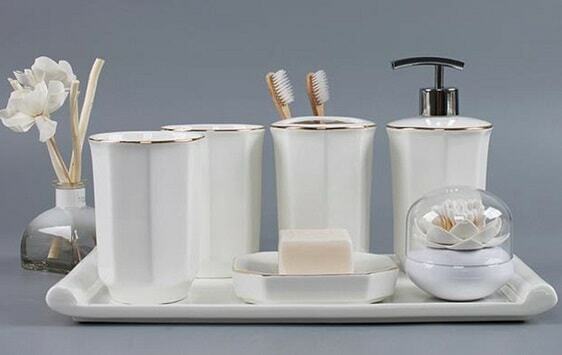 The set is made of non-toxic ceramic which is totally safe for daily use. It also doesn’t feel cheap which ensures its durability. The design of this white and gold bathroom accessories is quite similar to the previous one. It has the white overall look with the golden line accent but with a more curvy and decorative design. The product is made of ceramic which will not disappoint you. With such affordable price tag, you can get some reliable ceramic bathroom accessories to use for years. The stylish white and gold bathroom accessories with the European-style design which will make your bathroom look so fashionable. It looks quite decorative with its 3-D surface and catchy gold line. The set is made of ceramic which feels so sturdy yet smooth. It’s definitely a durable bathroom product that you can enjoy lastly. For you who want to decorate your bathroom with a festively decorative white and gold bathroom accessories, this one should be your top option. 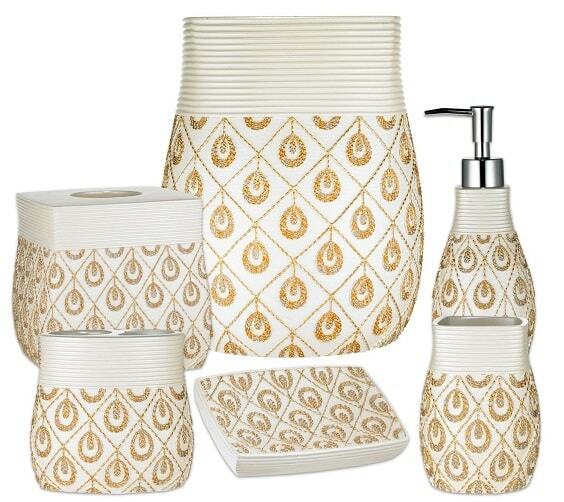 The set comes in a catchy Seraphina pattern in gold on the white background that you will totally love. Its resin construction is not really disappointing, it feels sturdy and firm. You won’t have to worry about the durability of this product. 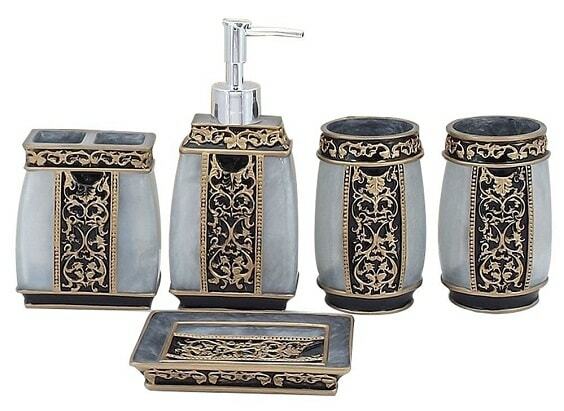 TheA�6-Piece Seraphia Bathroom Accessories by Moon_Daughter is offered at $180, on Amazon. You will get 1 soap dish, 1 lotion dispenser, 1 toothbrush holder, 1 tumbler, 1 tissue box and 1 wastebasket. 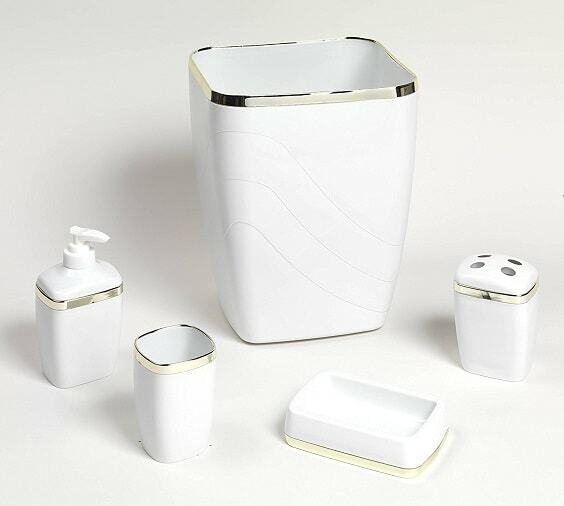 The contemporary white and gold bathroom accessories with a unique design which looks so chic. It’s designed in earthy stone style with a floral gold motif which makes it quite distinctive. With high-quality ceramic, you will have this et provides its function for you in years to come. You will also love the meticulous detail of its design. 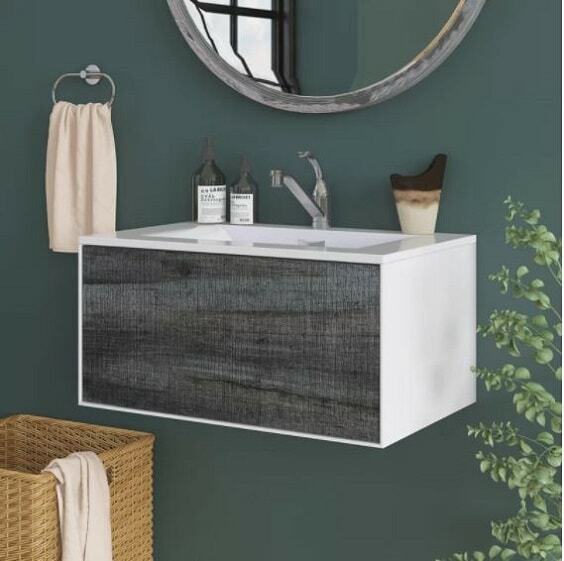 Spend around $35 to bring theA�5-Piece Bathroom Accessories Set by LUANTA�which is available on Amazon. The package includes 1 soap dish, 1 lotion dispenser, 1 toothbrush holder, and 2 tumblers. Another recommended product which is worth to include in your white and gold bathroom accessories list. It comes with a light grey finish with a classic accent in gold and black. 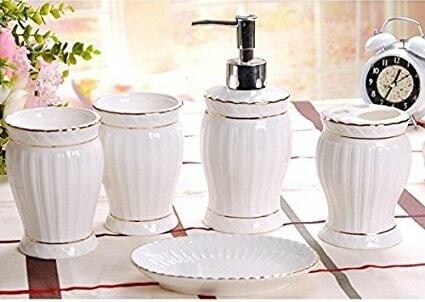 The material that builds up each of this set is high-grade ceramic with fine quality. It will not disappoint you at all. TheA�5-Piece Contemporary Bathroom Accessory by Generic is available on Amazon with $35.99 price tag. You will get 1 soap dish, 1 lotion dispenser, 1 toothbrush holder, and 2 tumblers. The European-style bathroom accessory is always an interesting one to enhance the beauty of the room’s decoration. This product is surely a good choice to buy with such style in white and gold look. Made of high-grade strengthen ceramic you don’t have to deal with such tricky things when you use other bath set with similar material. It feels so sturdy and durable enough. 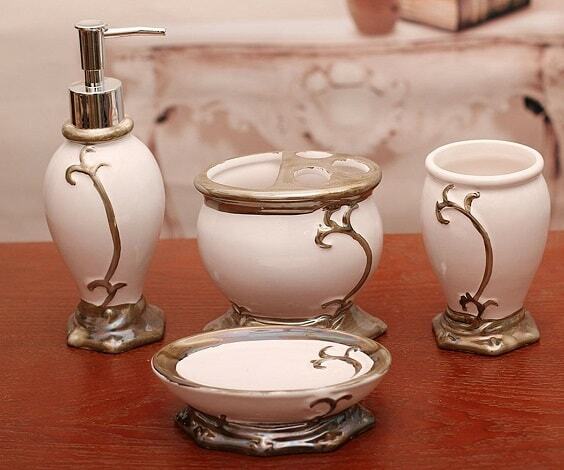 On Amazon, theA�4-Piece European Style Bathroom Accessories by YOURNELO is sold at $32.99. The package includes 1 soap dish, 1 lotion dispenser, 1 toothbrush holder, and 2 tumblers. 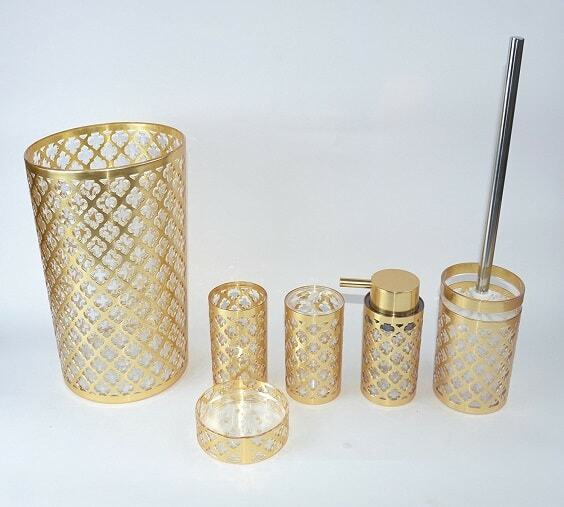 Another worth-to-buy white and gold bathroom accessories from Moon_daughter that you will love. Its vintage design with floral pattern and off-white finish are enhanced with the gold accent which looks beautiful. The resin material of this product is fairly reliable. You can use it for years with easy maintenance. By spending $180, you can get theA�6-Piece Savoy Bath Accessory by Moon_Daughter on Amazon, the set includes 1 soap dish, 1 lotion dispenser, 1 tumbler, 1 toothbrush holder, 1 tissue box, and 1 wastebasket. The festively vintage white and gold bathroom accessories to add another style to your bathroom decor. 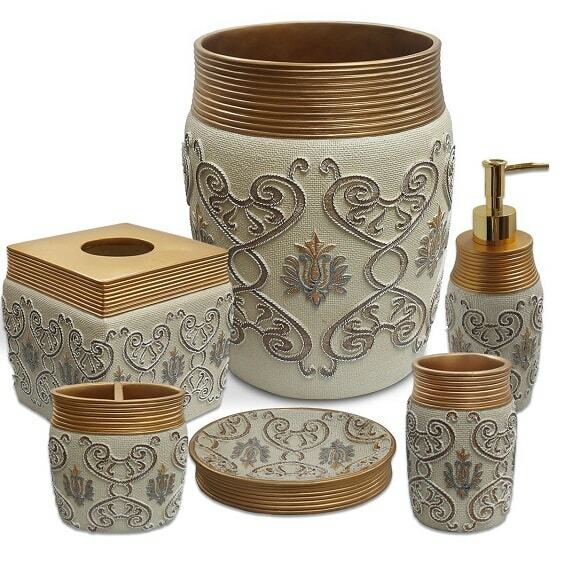 You will love the color combination of white, gold, silver, and brown of this set with its classic pattern. The material of this bath product is the durable resin which makes it reliable to use every day. Its pattern detail is also very meticulous. 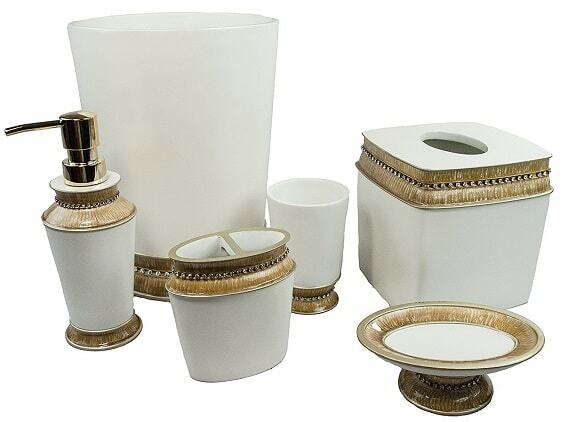 TheA�5-Piece Gold and Silver Bathroom Accessories by VU*LKD is offered at $163. By that price tag, you will get 1 soap dish, 1 lotion dispenser, 1 toothbrush holder, and 2 tumblers. So those are some white and gold bathroom accessories which you can buy. They will never fail to give such a beautifullyA�glamorous touch to your bathroom decor while still provides its basic function. Choose the one that matches the overall look of your bathroom decor to create such a harmoniousA�nuance. Keep in mind to check out the material that builds up the product to suit your bathroom condition. Going with white and gold bathroom accessories is not a bad idea since it will make the decoration look way more attractive. 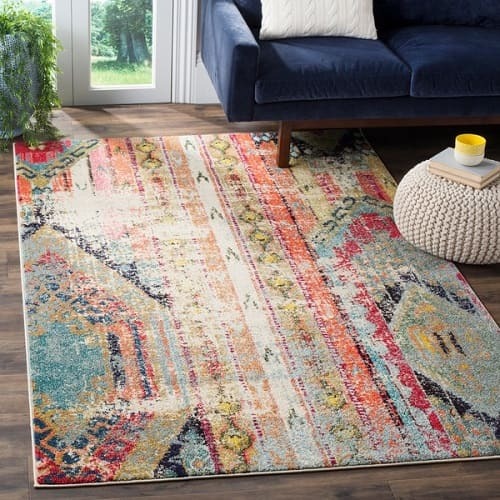 Such color combination always looks timeless to give a stylish touch to every room. Happy remodeling your bathroom then!